The Club has a monthly meeting. Typically there is an informative program at each meeting that relates to fishing or hiking, or the outdoors and environment. The general public is welcome to meetings. The public web site includes club history and information on fishing and high lake ecology. Content manager is David Berger while Brian Curtis and Kent Lufkin handle web development and design. New members will receive a password to provide access to the Member’s Only section of our web site. Members may also contact Members Only section manager Brian Curtis to request a password. The Member’s Only section includes a club roster, list of committee chairs and a searchable index of Washington high lakes. This index is a powerful tool for locating lakes. On this page you can also update your contact information, change your password and add a personal photo to the club roster – which you are strongly encouraged to do! You also enter surveys here, and can find more info on the survey program. You can also find people to go hiking and fishing with. Club members have a lively discussion forum. Only Hi-Lakers members are allowed to participate. This is where you ask questions, find a fishing buddy, post photos of last weekend’s trip and generally stay in touch. This is a critical service activity of the club. We provide detailed survey information on mountain lakes to the Dept. of Fish & Wildlife to help them manage the lakes for a quality fishery. 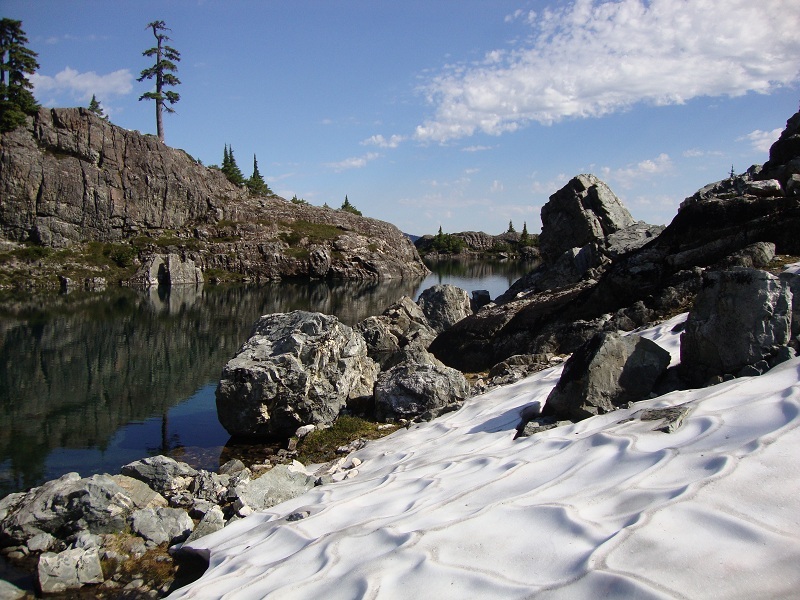 There are thousands of mountain lakes in Washington and only a handful of state biologists. Without help from volunteers, their job would be almost impossible. The survey form is filled in on line. There is extensive information about how to fill in a survey form, FAQ, and so on, available on the Member’s Only Discussion Forum. Any data reported may be restricted only to co-reporters of your trip and/or the State if you so indicate (a confidential survey). Your personal data is also stored for your personal use. Members who turn in a minimum number of surveys receive a summary of all non-confidential surveys submitted that year. It’s one of the nice benefits of being a member and turning in surveys. The biologists annually provide a list of lakes that they need surveyed. Brian Curtis manages survey data. Once a year in the early spring, we get together with the Trail Blazers for a potluck dinner with door prizes and raffle. It is a grand social event not to be missed. This event is organized by the Vice-President and others. Recently we have been having one meeting during the summer as an outdoor picnic. This has proven very popular, with BBQ food and a casting contest. The event is organized by the Vice-President. Several times a year there are club sponsored events, often family oriented, to special lakes. In the event a member needs help in the backcountry, the Go Team is ready to assist. Composed of members of both the Hi-Lakers and Trailblazers, we act as liaisons between family members and Search and Rescue (SAR) providing our expertise about the high lakes, route finding, and remote locations. We are in discussion with SAR to participate directly as well if one of our members needs rescue. All club members are encouraged to leave a detailed itinerary and Go Team contact information with a responsible party, and to carry the 10 Essentials and know their own limitations. Go Team contact information and procedures are available on the Go Team page in the members-only section of the website (login required) and in the members only forum (login required). If you need to contact the Go Team outside of these channels, please contact Rich O’Connell, the current Club President, or any club member. Every year members submit photos of their largest trout caught in a high lake (a high lake is over 2500 feet on the west side of the mountains or 3500 feet on the east side). First and second place add their photos to our Record Book, receive a plaque, and have their names engraved on the Club Kingfish Trophy Plaque. These days it seems everyone has to be political to protect their rights. Our club is active promoting fish stocking and trying to arrive at fair outcomes. There is an annual contest of photographs with winners selected by general acclaim. Various photographs may be seen on the website. After one year’s membership in good standing and submission of five surveys, members are eligible to take a class and build their own “Curtis raft” style raft that weights under 2.5 pounds with paddles and carrying bag, and fits in a pack.